View of the newly protected property on Illinois MountainRobert Rodriguez, Jr. Our purchase of this mix of orchards, forest and rocky slopes extending from the base to the summit of Illinois Mountain -- the highest point in the Marlborough Mountain chain -- is prominently visible from the City of Poughkeepsie (directly across the Hudson River) and nearby historic sites such as the Franklin D. Roosevelt Home and Presidential Library. The property's diverse vegetation and topography (including several wetlands) support an astonishing array of wildlife. 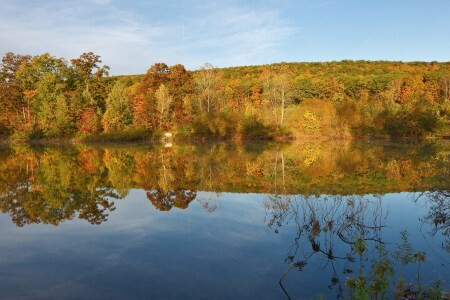 Lying within the state-designated Illinois Mountain Biologically Important Area, the land is adjacent to acreage previously protected by the Wallkill Valley Land Trust and the town. It provides a critical watershed for the town reservoir, which it also adjoins. A house on the property was built prior to the American Revolution. The town historical society has expressed interest in preserving the building. The purchase is part of Scenic Hudson's collaborative campaign to Save the Land That Matters Most, protecting 65,000 acres of great scenic, ecological and agricultural significance.